Allegheny has multiple machining capabilities, including milling, turning, surface grinding, surface planing, and broaching. We have 45 years of experience with all these facets of metal manufacturing. Our highly qualified, extremely talented machinists use all available tools to quickly and accurately serve your metalwork needs. 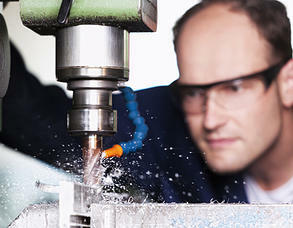 Contact us today, and we can tell you more about our precision machining and turning services. These double-column vertical machining centers are among the highest precision machining centers made by Mazak. Built for rigid accuracy, these machining centers utilize the revolutionary Mazatrol CAM M-2 to ensure high speed and high performance for all your milling requirements. These Mazak CNC Lathes can economically machine a single prototype part or full production runs. These computer-operated lathes boast a wide range tooling system and provide fast, accurate machining every time. For a precision ground surface, we use Blanchard grinding, well known for the trademark “cross-hatched” surface finish pattern resulting from a wheel-turning motion and the rotational movement of the work piece. Blanchard grinding utilizes more horsepower than other grinding processes and is also quicker, because multiple pieces can go through the Blanchard grinding process at once. This type of surface planer uses a single-point cutting tool to create a linear tool path. It is similar to a shaper but larger, with the work piece moving in linear motion beneath the cutter. The cut is similar to a lathe, although it is linear, not helical. Broaching is a process using a toothed tool, called a broach, to remove material and cut specific shapes into your metal. We use vertical broaching, in which the broach is run along the work piece to create the cut. Broaches are similar in shape to a saw, except the teeth get larger toward the end of the tool. Broaching is used to create precision shapes, on surfaces such as keyways, holes and splines. Copyright © 2019 Allegheny Paper Shredders Corporation. All rights reserved.